Recently, after turning on my Kindle I discovered a blank screen! Although I could access all my kindle free books, the screen saver would not come on when the kindle was idle. Worried, I checked the internet for a possible cause for this. It would seem many other kindle users had experienced similar problems, including some kindle users who could not even read their Kindle books. "Mine froze while using the browser; it was only 6 days old"! "My Kindle, Marley, is sitting next to me on my computer table as I type, and I am very worried about her!! WHY WON'T IT GO BACK TO NORMAL?????? 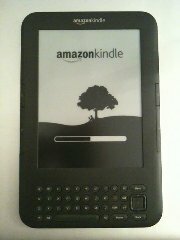 I am on the verge of tears, because me Kindle is brand-new, I got it for Christmas! Please help me"!! "I am having the same problem and my kindle is only 6 weeks old". A quick look at Google caused more upset by revealing a lot of titles referring to jail breaking your Kindle. That sounds like escaping from the (supposed) tyranny of Kindle as well as dangerous and unfixable if something goes wrong with the operation. Clearly this is something I did not want to do. This can usually be fixed with a simple technique requiring no running away from the law at all. Amazon says "Holding the power button to the right for 5 seconds until the light blinks 3 times then releasing the button will cure the problem". It didn't . . . However, (Good News Everyone) in practice I found that waiting 20 seconds before releasing the button worked fine. The Amazon kindle discussion board seems to agree with this as other users have had similar problems. By waiting for 5 - 20 seconds the kindle will reboot its' operating system and clear problems like this for you quickly and easily. Be patient with the reboot as sometimes the loading appears to stop. You just have to patient and not touch anything until it's finished the entire process. After "the twenty second fix." Your Kindle troubles will be literally erased from memory!